If you love Turkish 'chicken breast' pudding, a stiff, milky pudding that contains shredded chicken breast, you're sure to love its counterpart called 'kazandibi' (kah-ZAHN' dih-BEE'). In Turkish "kazandibi" means, the very bottom of the pan. That's exactly where this dish comes from. 'Kazandibi' is actually the 'chicken breast' pudding that has stuck to the sides and bottom of the pan while cooking. When the overcooked pudding is scraped off in long, wide strips, it's folded into portions with the darkened side up to make a roll. The caramelized outer layer gives the pudding a hearty, earthy flavor that contrasts well with the sweet, milky layer left on the inside. 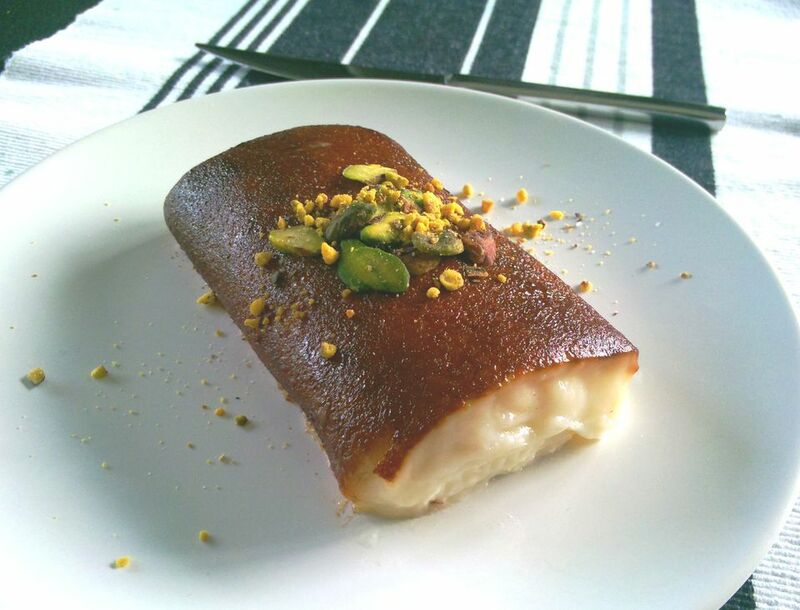 Like "chicken breast" and other milk-based desserts Turkish cuisine is known for, 'kazandibi' holds a special place in the hearts of adults and kids alike. 'Kazandibi' can be found at most Turkish restaurants and buffets. The very best comes from several famous chain restaurants that specialize only in milk desserts. Turkish pudding lovers flock to these cafes for a cup of Turkish tea or coffee along with their favorite dessert all hours of the day and well into the evening. Many home cooks still make 'kazandibi' even though it's time-consuming. Start out with fresh milk and the freshest chicken breast meat you can get. You'll need a large saucepan to cook the pudding and two rectangular metal baking dishes, one that fits inside the other. Here's how to do it. Begin by preparing the ''chicken breast' dessert recipe as directed. After the pudding is finished cooking, but before you refrigerate it, you need to caramelize one side to darken it. To do this, sprinkle five to six tablespoons of powdered sugar to cover the bottom of your smaller heatproof metal pan. While the 'chicken breast' pudding is still warm, pour it evenly over the powdered sugar and allow it to spread across the pan to reach the edges. You can help spread it by gently using the back to a wooden spoon, but don't be too aggressive or you'll upset the layer of sugar below. Using the largest burner on your stove, light a medium flame and place your pan over it. Wearing an oven mitt, rotate the pan continuously so all the areas are exposed to the heat evenly. Continue changing the pan's position until the sugar is caramelized and the bottom of the dessert becomes a rich, golden brown. You can check it progresses by lifting up the corners gently. When you're satisfied with the color, remove the pan from the heat. Place it on the larger rectangular tray filled with ice and water. Let it cool down. When the dessert reaches room temperature, cover it with plastic wrap and refrigerate it overnight. Before serving, you can cut the 'kazandibi' into squares or make longer strips and roll them gently as you put them on the serving plate. Always serve your 'kazandibi' with the dark side up. You can garnish your "kazandibi" with ground pistachio nuts or hazelnuts, a sprinkle of cinnamon or grated coconut.